Christmas lights are one of many of my favorite things about Christmas time and this year we actually put up some that look really awesome in our front yard. 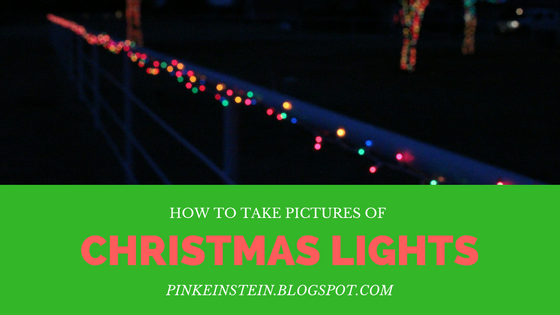 I experimented with my camera to find some cool ways to take pictures of the Christmas lights and I'm here to tell you how you can too! So I started off by just seeing what a picture would look like without changing settings. This is with auto focus on, daylight white balance, 1/80 shutter speed, and an aperture of 11. This is just a mediocre picture that I wasn't too pleased with. Next I turned off the auto focus and focused it to get bokeh (circles) instead of lights. Tip: don't make it totally out of focus or you get this. Your picture isn't going to turn out just like it looks through the view finder. This is with auto focus off, auto white balance, 1/80 shutter speed, and an aperture of 11. I did the exact same thing for as I did for the last picture only I focused it a little more and I like the way it looks. These tips are more for taking picture for your blog not necessarily to show how the lights look but they are great to use as blog post headers like I did.